Work being carried out on the historic India Buildings could leave roads in the city centre closed or affected until April next year. The buildings are being renovated to hold the new regional centre for HM Revenue and Customs (HMRC). Some of the streets around the buildings including Fenwick Street and Drury Lane could be shut for up to two months to give the landmark a new look. A spokesperson for HMRC told JMU Journalism: “As part of our plans to create a tax authority fit for the future, we are transforming our estate by replacing our existing 140 offices with 13 regional centres located across the UK. “In August 2017, we announced India Buildings will be the location of the Liverpool regional centre. The famous Grade II-listed India Buildings are now being modernised ahead of the tax office’s switch. The renovations will see the arcade through the middle of the building closed to the public. A petition was launched earlier this year to keep the arcade through Liverpool’s India Buildings open to pedestrians. However, that has now been unsuccessful, despite it gaining more than 850 signatures. The location was praised by Historic England for its “central arcade with its coffered barrel-vaulted ceiling and decorative bronze shopfronts”. To allow work to begin, roads and footpaths around the building have now been closed – and they are set to be affected well into spring 2018. 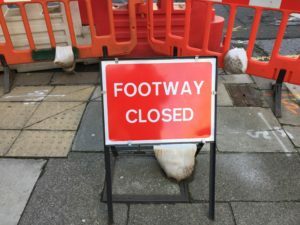 Drury Lane will be closed to vehicles between Brunswick Street and Water Street, however pedestrians can still get through. Along with this, a number of footpaths have been closed, including Water Street outside the India Buildings.